The intertwining of addiction and responsibility in personal, philosophical, legal, research, and clinical contexts. Addictive behavior threatens not just the addict's happiness and health but also the welfare and well-being of others. It represents a loss of self-control and a variety of other cognitive impairments and behavioral deficits. An addict may say, "I couldn't help myself." But questions arise: are we responsible for our addictions? And what responsibilities do others have to help us? 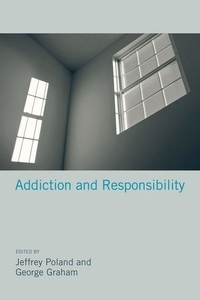 This volume offers a range of perspectives on addiction and responsibility and how the two are bound together. Distinguished contributors--from theorists to clinicians, from neuroscientists and psychologists to philosophers and legal scholars--discuss these questions in essays using a variety of conceptual and investigative tools. Some contributors offer models of addiction-related phenomena, including theories of incentive sensitization, ego-depletion, and pathological affect; others address such traditional philosophical questions as free will and agency, mind-body, and other minds. Two essays, written by scholars who were themselves addicts, attempt to integrate first-person phenomenological accounts with the third-person perspective of the sciences. Contributors distinguish among moral responsibility, legal responsibility, and the ethical responsibility of clinicians and researchers. Taken together, the essays offer a forceful argument that we cannot fully understand addiction if we do not also understand responsibility.